Photo One: Kyle Sorensen of Ballston Spa, N.Y., (right) accepts the Asphalt Mini Stock division’s Most Improved Driver Award from Devil’s Bowl Speedway’s Alayne Bruno (left). 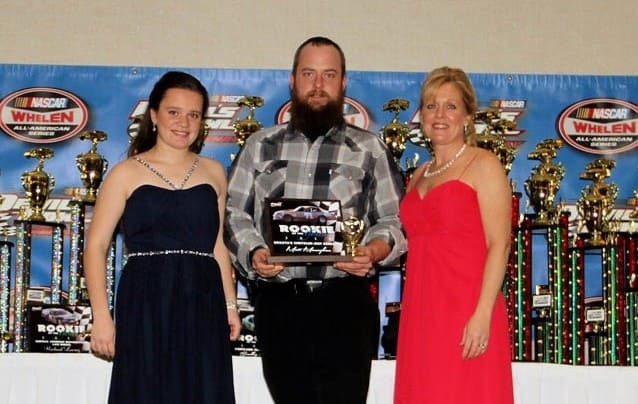 Photo Two: Richard Lowrey III of Charlotte, Vt., (center) accepts the Asphalt Late Model division’s Rookie of the Year Award from Devil’s Bowl Speedway’s Austin Bruno (left) and Alayne Bruno (right). 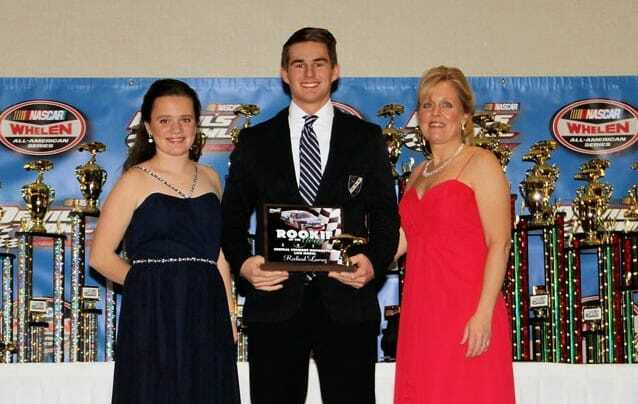 Photo Three: Matt Monaghan of Colchester accepts the Asphalt Renegade division’s Rookie of the Year Award. RUTLAND -—A sold-out crowd of more than 370 stock car drivers, team members, race officials, sponsors, and media put the cap on the 2015 Devil’s Bowl Speedway racing season on Saturday, Jan. 30 at the track’s annual Banquet of Champions. The event was hosted by the Holiday Inn Rutland-Killington in Rutland, Vt., and officially crowned the season champions in eight different divisions at the West Haven, Vt., speed plant. Several special annual awards were also presented, including the track’s highest honor, the John Bruno Award. The trophy was shared by Debbie Eddy of Fair Haven, Vt., and posthumously by her longtime partner, Ron White, in recognition of their significant lifetime contributions to racing while maintaining high standards of conduct and respect on and off the track. The couple has fielded winning Modifieds for drivers including Harry Peek, Ray Hoard, and most recently Ron Proctor. Proctor drove the team’s car to a 100-lap victory on May 9, just four days before the unexpected passing of the well-liked Ron White. Ms. Eddy, upon accepting the award, received an extended standing ovation. Brandon, Vt., veteran Vince Quenneville Jr. collected his first championship on the asphalt half-mile in the Modified division of the NASCAR Whelen All-American Series. Quenneville’s five-win season was enough to edge Proctor for the title while Greg Atkins, the late Leon Gonyo, and Billy Lussier completed the top five. Tribute was also paid to veteran driver Gonyo, of Chazy, N.Y., who passed away suddenly on Sept. 19, moments after winning the final asphalt Modified race of the season. Matt Gonyo accepted his father’s fourth-place trophy with a moving speech, and he, too, received a lengthy standing ovation. Other asphalt track champions included Josh Masterson of Bristol, Vt., in the Late Models; Robert Gordon of Milton, Vt., in the Renegades; and Chris LaVair of Gabriels, N.Y., in the Mini Stocks. Masterson and LaVair were each their first-time champs in their respective divisions, while Gordon’s title was his third in four years. Rookie of the Year titles went to Bob Kilburn of Fair Haven, Vt., (Modified), Richard Lowrey III of Charlotte, Vt., (Late Model), Matt Monaghan of Colchester, Vt., (Renegade), and Bradley Bertrand of Ferrisburgh, Vt., (Mini Stock). Kenny Tremont Jr. of West Sand Lake, N.Y., added to his legendary career with his seventh Devil’s Bowl championship. The title, which came in the Sportsman Modified class of the Dirt Track Series, was his first on the new 3/10-mile Dirt Track at Devil’s Bowl. He beat Tim Hodge, Jackie Brown Jr., Quenneville, and Josh Sunn for the crown. Darrell Older of Ballston Spa, N.Y., and Brian Bishop of Bridport, Vt., also won dirt championships. Older’s title was in the Renegade division, while Bishop topped the Mini Stocks. Brett Wood of Georgia, Vt., collected his first title in the Enduro Series, which holds races on both track surfaces at Devil’s Bowl Speedway. Sportsmanship Awards were given to drivers from each division on both the asphalt and dirt, as determined by a vote of their peers. On the asphalt side, awards went to Bob Kilburn (Modified), Steve Miller (Late Model), Robert Gordon (Renegade), and Chuck Bradford (Mini Stock), while dirt trophies went to Billy Lussier (Sportsman Modified), Matt Mosher (Renegade), and Chris Cardarelli (Mini Stock). Most Improved Driver laurels, also voted on by drivers, were bestowed upon asphalt racers Billy Lussier (Modified), Seth Bridge (Late Model), Scott FitzGerald (Renegade), and Kyle Sorensen (Mini Stock). Devil’s Bowl Speedway’s 50th season of racing will include NASCAR Whelen All-American Series-sanctioned action for both the asphalt half-mile and the dirt 3/10-mile tracks, totaling 27 scheduled events. The asphalt track will race primarily on Saturday nights, and the dirt track will race primarily on Sunday nights; opening weekend is scheduled for May 21-22.